TechPats specializes in WiFi communications. We have a number of technical experts with over 25 years of experience in R&D, product development and development of standards. Our areas of specialization cover 802.11 a, b, g, n, ac, ad, af, ah, ai, aj, aq, ax, ay and future standards. We also have testing capabilities that allow us to conduct testing both in a lab environment (captive testing) and in live commercial networks. 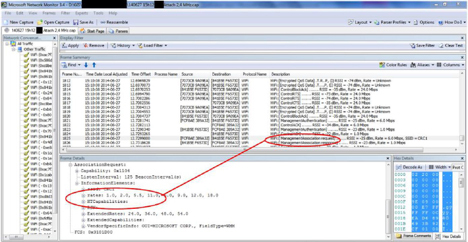 Other more traditional reverse engineering capabilities such as software RE and circuit extraction are also available when testing solutions are not sufficient for uncovering EoU (Evidence of Use) in IP (Intellectual Property) cases. 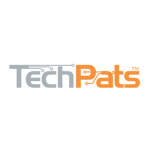 Whether to confirm use of an essential feature of a standard, an optional feature of the standard, an implementation specific feature related to the standard or other non-standardized feature, TechPats has a wide range of capabilities for testing those features. Each solution has it advantages and disadvantage and we select the best solution for our clients’ needs. Figure 1 shows an example test setup for WiFi testing. 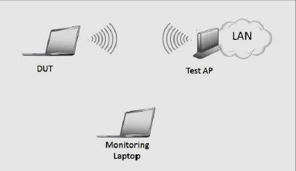 A DUT (Device Under Test) is connected to a WiFi network and a monitoring laptop is capable of monitoring the communications between the DUT and WiFi test AP (Access Point). In the test setup of figure 1 the monitoring laptop contains an application for passively listening to WiFi transmissions between the DUT and the test AP. Figure 2 shown a screen capture of the messaging between the DUT and the test AP, together with the protocol information transmitted as part of the messaging.